Please complete the information below to receive news updates. We are committed to protecting your privacy and will never share your email address or information. 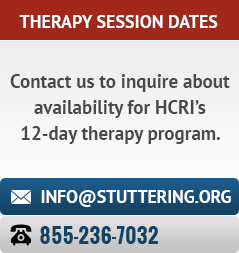 HCRI's approach to stuttering therapy is objective, comprehensive, and results driven. Our research demonstrates that speech distortions of stuttering are produced by faulty contractions within the muscles of the tongue, lips, jaw, and vocal folds. The result is that the speech organs, during stuttering, move into positions that distort the sounds to be spoken. Our laboratory studies led us to define a series of behavior patterns that can replace the distorted contractions and movements that give rise to stuttering. The new behaviors actively generate fluent speech.We refer to these new muscle contraction/movement patterns as “targets.” The essential point is that we have empirically defined targets and we have empirically established their efficacy in generating fluent speech for thousands of people who stutter. In addition, targets have objective properties. That means that people in therapy and our clinical staff can clearly recognize and share critical information that lies at the heart of successful treatment. Our clients learn precisely what they do with their speech muscles in order to speak fluently. Targets are physical entities. They have clearly specified physical definitions that include central values and permissible ranges of variation. And, they can be readily learned and retained through our specialized training system. We know that others who purport to treat stuttering sometimes use the term “target.” Unfortunately, we have found that this term is used so generally in different settings that it may, in fact, have little therapeutic validity when used outside the HCRI environment. When we talk about targets, you can be certain that we have valid, first-hand knowledge of this subject. After all, we originated the use of targets within our systematic, comprehensive, computer facilitated stuttering treatment program. Targets are vital to our work. However, appropriate methods and sequences of training used in treatment are essential for the correct acquisition and retention of targets for lasting fluency. Therefore, we went to work on developing objectively defined, effective instructional protocols. We use laboratory-derived principles of learning to foster efficient and lasting target use. One of the outcomes of our research on the therapy process is that we have also identified new ways in which learning principles can be used to enhance stuttering therapy. In particular, these discoveries have led to improved transfer of clinically acquired fluency skills into everyday life. To maximize target learning, we further added to the objectivity of treatment by inventing and utilizing new speech measurement technologies, which evaluate and provide real-time feedback on the accuracy of target production by clients. We also developed computer software that enables clients to learn fluency skills with increased reliability and efficiency. The introduction of quantitative measurement in our stuttering therapy is analogous to physicians moving from subjective evaluations of blood pressure to actual measurements with the sphygmomanometer. The use of our speech measurement technologies advances stuttering treatment to new levels of objectivity and reliability. Please remember, we invented and were awarded U.S. patents on our electronics. One of the most important variables in the development of our therapy system was to analyze the role that clinicians´ behaviors play in the delivery of treatment. After significant study of clinician instructional techniques, we defined specific, detailed clinical skills for effective therapy administration. These skills are now codified and incorporated in our treatment program. For more information on HCRI clinicians, click here. We regard our work as a continuing process of improving our understanding of the critically important details that create a successful treatment program. Each new version of our therapy reflects advancements in HCRI's definition of targets, training methods, technologies, and clinical skills. Our latest stuttering therapy program, Hollins Fluency System III: High Definition Speech Reconstruction for Stuttering, is the most sophisticated stuttering treatment system we have created. It is designed to makes the learning of life-long fluency skills easier and more robust. The program incorporates more precise definitions of speech behaviors that generate fluent speech and greater specificity in therapy instructions sets that make fluency possible for people who stutter. Participants benefit from new discoveries in speech-signal analysis that enable more detailed measurement of utterances and instant, highly accurate feedback. These capabilities drive the acquisiton and retention of fluency skills, as well as accelerate the transfer of new speaking capabilities from HCRI's clinical setting to everyday life. Including "high definition" as a descriptor in our program name calls attention to the exceptional level of detail that defines how effective stuttering therapy must be structured, delivered and measured. After participating in HCRI therapy, the majority of clients say they were able to advance their careers and earnings.